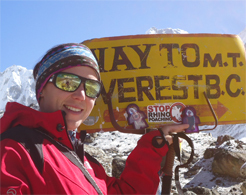 If you are a mountaineer or at least a trekker then your last resort is Everest Base Camp. It is the place where you feel closest to the roof of the world the Mt Everest 8,848 (29,028ft). The route offers you mesmerizing Himalayan scenery including Highest peak of the world “Mt. Everest, Mt. Lhotse, Mt. Nuptse, Mt. Amadablam, Mt Pumori, Mt Thamserku, Island peak etc. The trekkers who go for the Everest Base Camp trekking could reach one of the best viewpoints on the planet the Kala Pattar (4,350 m 13,945 ft). This doorway to Everest; a destination for thousands of tourist from around the globe, overlooks astounding panorama of nearby some of the highest peaks on the earth along with Khumbu glacier and down there a spectacular alpine valley. Not only mesmerizing Himalayan scenery you may explore the tradition of Tibetan Sherpa culture and the Monasteries along with the wilderness of its flora and fauna in Sagarmatha National Park. Arrival in Kathmandu where a Orbite Nepal Adventure representative will meet you at the airport and transfer you to your hotel . Overnight at hotel. Day 02: Trip arrangements and sightseeing around Kathmandu Valley. This day we will give you the details information about trekking program and coordinate any last­minute arrangements. After/before the staff meeting, we will take you sightseeing with a tour guide to visit the highlights of Kathmandu ­ Pashupatinath, Boudhanath Stupa, Swaymbhunath and Patan Durbar Square. Overnight at the hotel. You will take the 45m flight to Lukla (2 840m)This is the place to start trekking for Khumbu region, you will see amazing views of terraced hills and the distant Himalayan massive. On the way to Phakding you will pass stone walls, sacred for Buddhists, made from hundreds of stone tablets and giant carved boulders, brilliantly decorated with brightly colored paintsthree . Overnight the at teahouse. After break fast continue hiking to Namche bazaar along the banks of the Dudh Kosi river, through stands of pine and oak trees, crossing some impressive suspension bridges. Namche bazaar is the gateway to the Everest region and the Sherpa Capital which is a colorful village with many wonderful and interesting shops . Overnight at a teahouse. Aclimatization at Namche bazaar with the surrounding mountains views we will take a day rest for acclimatize . This day we will hike up the villeage for the view of Mt. Everest, Lhotse (the 4th highest peak ), and Ama Dablam. we can also visit the Sherpa Museum . Overnight at a teahouse. After breakfast at Namche Bazar, We leave Namche Bazaar by follwing therushing glacial waters of the Dudh Kosi with magnificent views of the mountains of Tengboche (3860 meters). Tyangboche is a beautiful place with a wonderful monastery and is the spiritualcenter from Tyangboche wewill see the panoramic views of Kwangde, Nuptse, Lhotse, Kangtega, Ama Dablam and Everest. Overnight at a teahouse. Treak from tyangboche by crosses impressive suspension bridge on the Imja Khola river and climbs to Pangboche among thousands of Mani stones holding a ‘Yeti Scalp’ in its Gompa. dingoche is lokaed just under the Mt ama dablum. From hear we can see views of Lhotse, Island Peak, and Ama Dablam. Overnight at a teahouse. Day 08: Dingboche to lobuche (4940m/16207ft) – 5­6hrs. After treak about 5­6 hours we will meet up at lobuche . You will be able to feast your eyeson the Khumbu Ice­fall, Pumori and many smaller peaks from ridge tops on the track. Overnight at a teahouse. This will be the difficult day because of the walking along the Khumbu glacier and up to Everest Base Camp at an elevation of 5365 meters. Everest Base camp is the closest you can be to Mount Everest without mountaineering equipment. You may see a group of people attempting to climb the mighty Mount Everest. We will then hike back to Gorak Shep. Overnight at Teahouse. We wake up early in the morning and start our hike to Kala Patthar . The climb is challenging but you will be rewarded with the unpresidented, spectacular views of Mount Everest and the surrounding Himalayas. Everest, the highest point on the planet at 8848meters (29028 feet) towers directly ahead and on all sides emerge the other giants, Nuptse, Pumori, Cholatse, Lhotse and countless others. We then head back to Gorak Shep, a tiny village at 5180 meters and head further down to Periche. Overnight at Teahouse. Day 11: Pheriche To Phortse (3810m/12550ft) 4­5hrs. We will treak back to Namche bazar which is about 5 hours . over night at the teahouse . Day 13: Namche to Lukla (2840m/9320ft) – Approximately 6.5 hours. After the short flight you will transferred back to your hotel. This day you can do some shopping in kathmandu . * Domestic Airport picks up & drops by private vehicle. * Three star hotel in Kathmandu with breakfast. * Guided Kathmandu city tour with entrance fees by private vehicle. * All your standard Meals (breakfast, lunch and dinner) during the trek. * Teahouse accommodation during the trek. * Government licensed English speaking Guide and Porters to carry your luggage during the trek (1 porter Between 2 Person basis), their food, accommodation, salary, insurance, equipments,medicine. * Round Trip flight fare KTM –Lukla­­ KTM & domestic airport taxes in Kathmandu and Lukla. * Sagarmatha National Park fees. * Trekker’s information management system(TIMS) card fee. * Mosaic adventure duffel bag, jacket and sleeping bag to use during the trek. * Farewell dinner in Kathmandu. * All our government taxes and official expenses. * Lunch and dinner during Kathmandu & Pokhara Stay. * Clients’ travel insurance (compulsory). * International airfare and airport departure tax. * Nepal entry visa fee. * Personal expenses such as alcoholic drinks, cold drinks and mineral water etc. * Tips for trekking staffs and driver etc. * All expenses which are not mention in price include section.